CATAWBA COUNTY, North Carolina -- A religious group's controversial billboard that supports President Donald Trump's immigration ban has cropped up along Interstate 40 in Catawba County, according to WSOC. 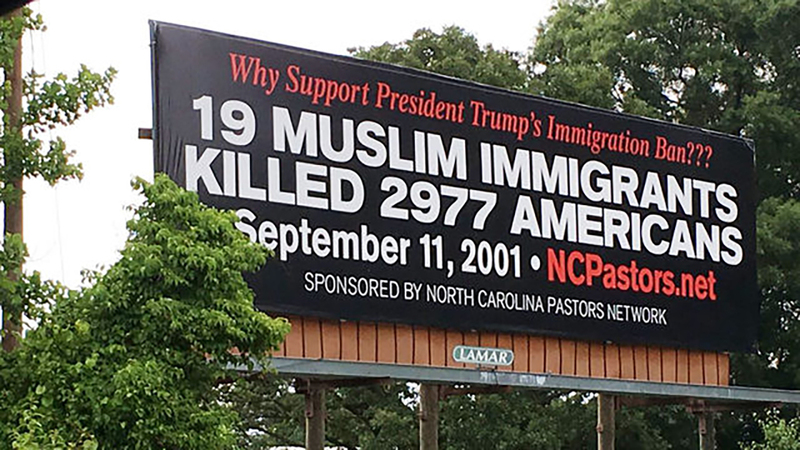 The billboard, funded by the North Carolina Pastors Network, points to the terrorist attacks on September 11 and those behind it. The group is headed by evangelist Dave Kistler. He doesn't think the billboard's message is hateful. "I'm saying it now, that this is not what this is about," Kistler said. "There's certainly nothing hateful in our billboard. Some have interpreted it to be that and say that. It was not. It is the truth." WSOC reports nearby citizens disagree over the message. "I think the numbers are powerful enough in themselves," one supporter said. "So, if you look at it and think something is wrong about it, it makes you wonder about you." "I believe in the Christian way and that's to embrace everybody," said Oliver Reitzell, who opposes the billboard's message. "Kind of the hate message behind it. I'm not for that." The North Carolina Pastors Network said it has no plans to take the billboard down. Read more from WSOC here.